Two ways miter cutting (45°-0°- 60°). New round working table providing precision mitering, yet preventing the sawband to scratch its surface as the cut is completed. Precision blade-guide with hard metal pads, bearings and anti-corosion treatement. 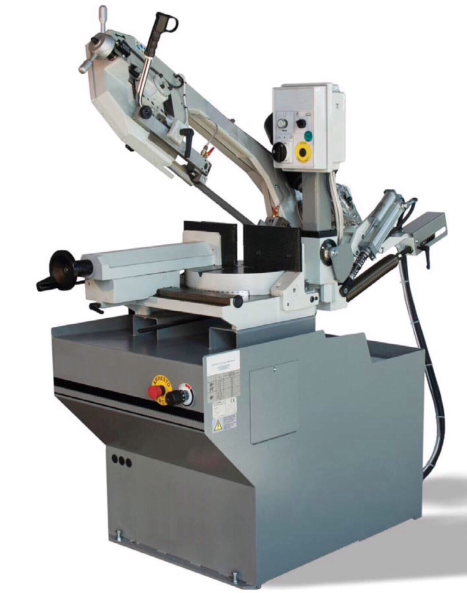 Cutting cycle: vice locking of material to cut - the sawband runs as long as the operator holds the gripswitch - manual pull down of the sawframe. Machine bed in thick metal works exclusively made by domestic workshops. High level machining and finishing of the parts. Vice and sawframe in cast-iron providing high stability and vibration free cutting. Side-to-side mobile vice with quick approach lever. New round working table providing precision mitering, yet preventing the sawband to scratch its surface as the cut is completed. Designed to avoid rust seizure and chips jamming. Mechanical blade tension with handwheel. Precision blade-guide with hard metal pads and roller bearings. Anti-corrosion treatement with electrolytic nickel-plating and galvanization zinc plating ensure long lasting cutting precision. Electric motor and reduction unit from domestic ISO certificated manufacturers. Electric installation according CEE. Set of fuses against current overload. Motor protected thermal feeler. Safety microswitch on the blade protection. Coolant liquid with electropump and crucible. Gravity downfeed with adjustable speed. PNEUMATIC VICE: automatic locking and opening of the vice. Rollerway 2 meters long on loading side (capacity 240 kg). Rollerway 2 meters long on unloading side (capacity 240 kg) with bar stop.